October 2018 saw the opening of Tūranga, our new Central Library. The Discovery Wall is one of the showcase attractions in the library, and is also where Photo Hunt entries can be found. The images can viewed online, and on the Discovery Wall in Tūranga - as well as at the mobile wall that is visiting our network libraries. We have been delighted to receive 247 submissions this year, telling your varied stories spanning more than a century, 1907 to October 2018. Thank you so much for sharing your memories and contributing to our photographic history. This year’s judges were Sarah Snelling (Digital Curation Librarian), Rachel McRobb (Exhibitions Project Manager), and Jacqui Stewart (Digital Content). They met on 12 November to decide on the winners in Places and People categories, and an overall winner. Thanks to the team at Photo & Video International for providing an A2 canvas print to the winner, and vouchers for the two category winners. The judges noted that this year the photos reflected Christchurch’s social history. In a year that marks many milestones for New Zealand: the ending of the First World War, the 125th anniversary of women's suffrage, the Influenza epidemic and many others. It was interesting to get submissions that reflected our Christchurch stories over this time, right through to the present day. We received several collections telling us about 1970s New Brighton, people at leisure and work, women at the Women’s immigration centre, lost Christchurch and new Christchurch. We are also grateful to our regular contributors to Photo Hunt who over the past eight years have been sharing their family stories and are creating their own collections online. Take the time to view this year’s Photo Hunt submissions. You can contribute to our collection anytime by joining up to the website, or we can scan photographs for you if you drop them in to your local library. 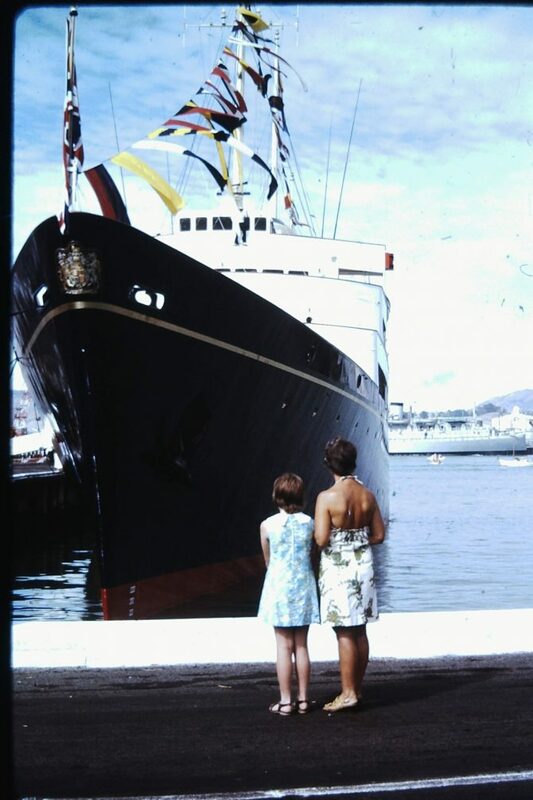 Photographically striking image with the juxtaposition of people and the size of the ship and the dark hull against the lighter sky and people. 1974 was a significant time in Christchurch’s history. There was a Royal visit as the Commonwealth Games were held in Christchurch. Easily identifiable as an era by the 1970s fashion. It also shows a different time by the public access to the wharf. Isabel has been a regular contributor to our photographic digital collection. Her images are a varied insight to Christchurch in the 1950s to 1970s. 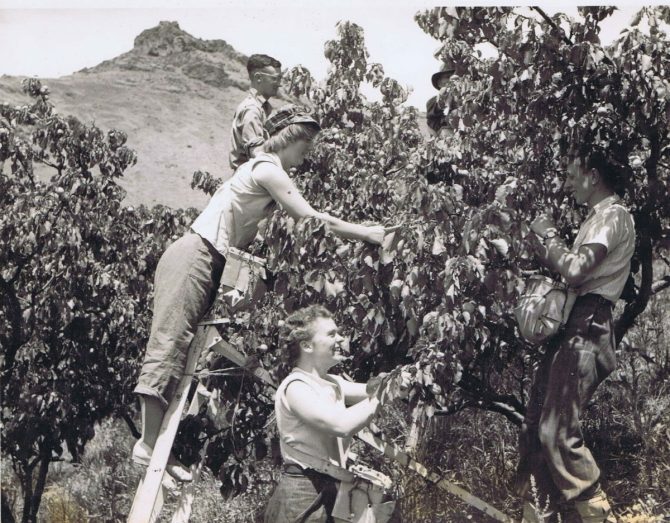 This image gives a sense of time and place with the distinctive Castle Rock and Port Hills in the background and the iconic family working together picking fruit. We can see a way of life that is almost lost in Christchurch, the rural orchard life so close to the city in the 1950s. The judges like that the photo gives a feeling of a hot Christchurch summers day and the romantic notion of fruit picking. Image shows a family outing that would have been a treat. The children show us the clothing, which probably would have been homemade, and hairstyles of the day and life in the early 1960s. The tiny bit of the interior of the train that we can see will remind some of train trips they took. 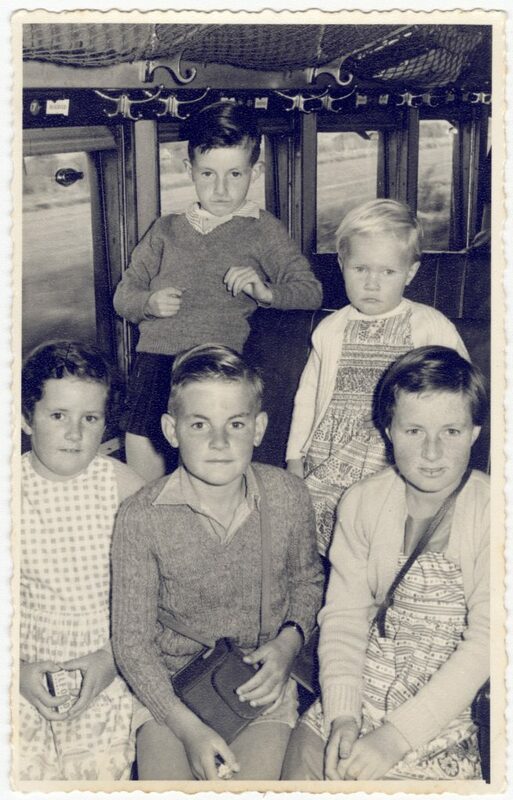 Flora has sent us many photos sharing her family history giving us a wonderful insight into Christchurch past. This is a winning image as the judges liked the sense of place and time, the busy and vibrant city and modes of transport shown. 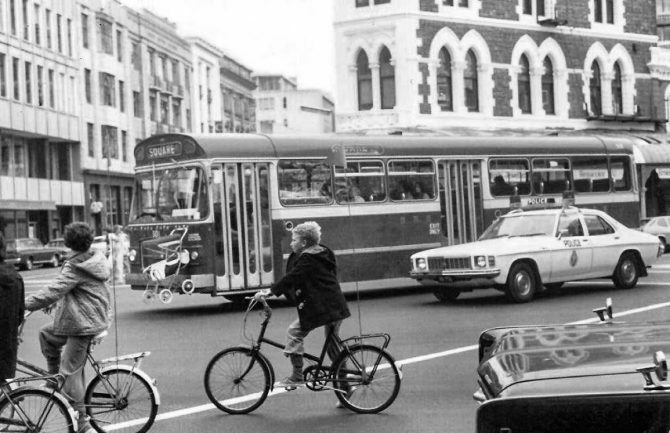 It shows a glimpse of transport history in the CBD with the police car, bus with the pram at the front and the bikes with tall flags and young cyclists with no helmets. An album of photographs was handed in for Photo Hunt this year. It contained photographs documenting 1960s New Brighton, including the demolishment of the wooden New Brighton pier. 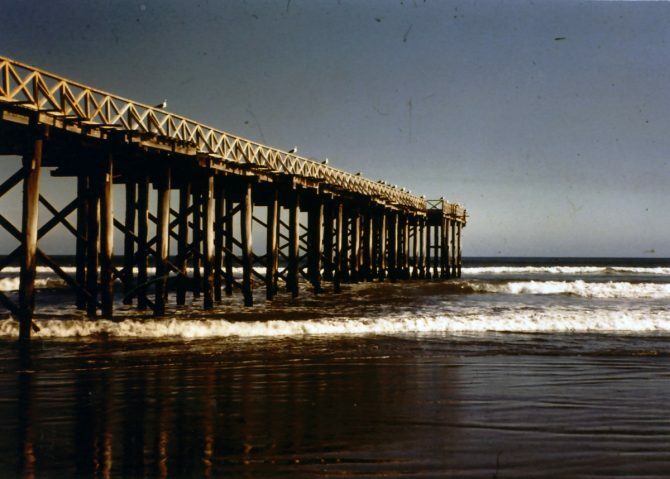 This shows the pier in the early morning not long before the team started demolishing it. This image was chosen not only because of the light and composition and being a nice photo but also because along with the other photos in the collection it tells a story about New Brighton in the 1960s. 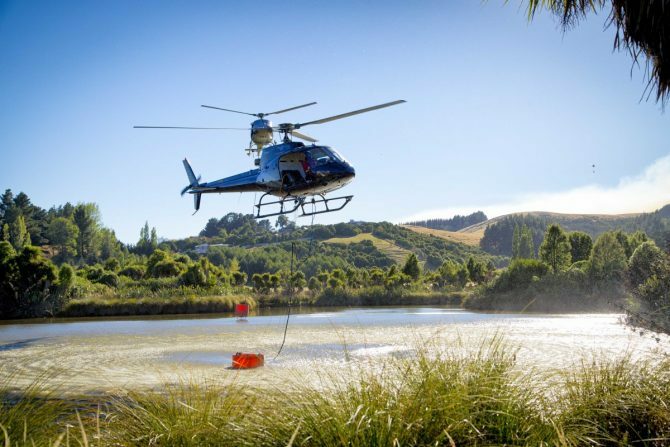 This photo from the 2017 Port Hill fires documents a recent event in Christchurch that headlined the media for several days and affected many Christchurch residents. The scars of the fire can still be seen in the Port Hills. This photo tells part of the story of the Port Hills fires. This entry was chosen because it was felt it represents the rebuild and a very typical CBD image of someone in a hi-viz jacket and a road cone and road sign. 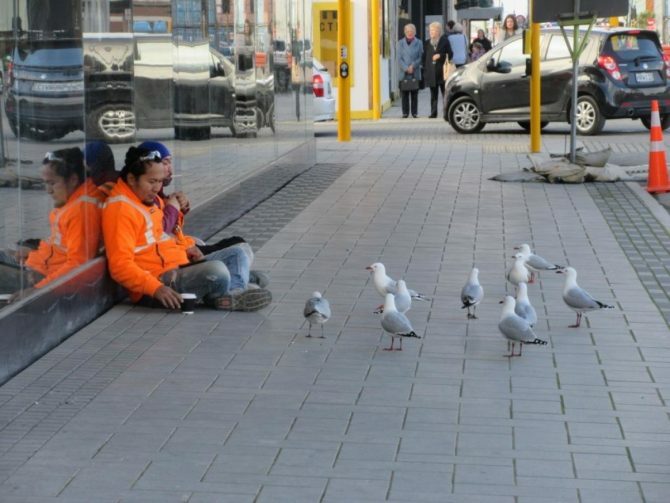 The judges liked the image of the people involved in the rebuild and the interaction with the seagulls. Photographically the reflection gives another interesting dimension to the image. 1 July 2018. 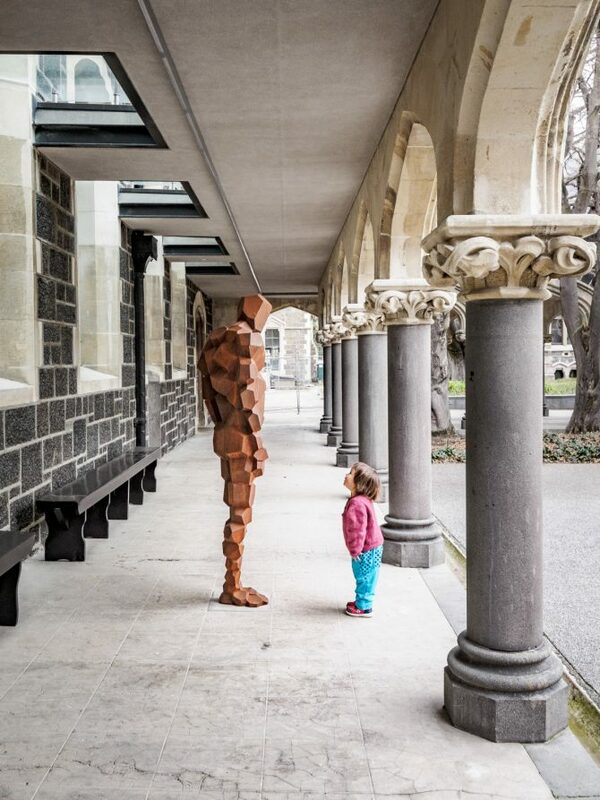 A toddler greets the Stay sculpture by Anthony Gormley in the north quadrangle of the Christchurch Art Centre. Christchurch City Libraries collection. In copyright. People loved this image of the small child interacting with the sculpture. The heritage of the repaired Arts Centre and the modern sculpture, placed at the Northern Quadrangle of the Arts Centre, and the new generation represented by the child.